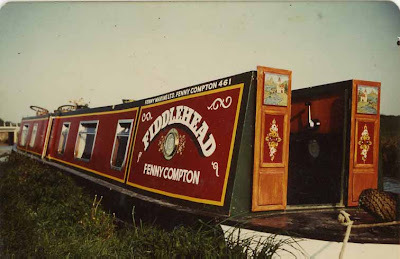 This Friday post is an ongoing canal boat feature in honour of my Gran, who was the proud owner of her very own English canal boat named "The Fiddlehead." Gran currently lives in a nursing home and this is my way of staying in touch on a regular basis because Friday is her mail day! 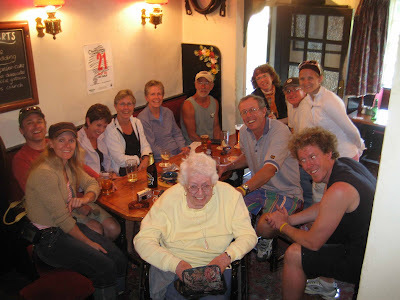 The pictures in these posts come from Gran's own scrapbook as well as a recent family trip in 2007 that included 35 family members ranging from 8 months to 91 years old (Gran herself) on 5 narrow boats touring along the Leicester Loop. The British canal system of water transport played a vital role in the United Kingdom's Industrial Revolution and the UK was the first country to acquire a nationwide canal network. This was a time when roads were only just emerging from the medieval mud and long trains of pack horses were the only means of "mass" transit of raw materials and finished products. It was no accident that amongst the first canal promoters were the pottery manufacturers of Staffordshire. The canal system came into being because the Industrial Revolution (which began in Britain during the mid-18th century) demanded an economic and reliable way to transport goods and commodities in large quantities. Some 29 river navigation improvements took place in the 16th and 17th centuries starting with the Thames locks and the River Wey Navigation. The 20th century brought competition from road-haulage, and only the strongest canals survived until the Second World War. After the war decline of trade on all remaining canals was rapid, and by the mid 1960s only token traffic was left, even on the widest and most industrial waterways.